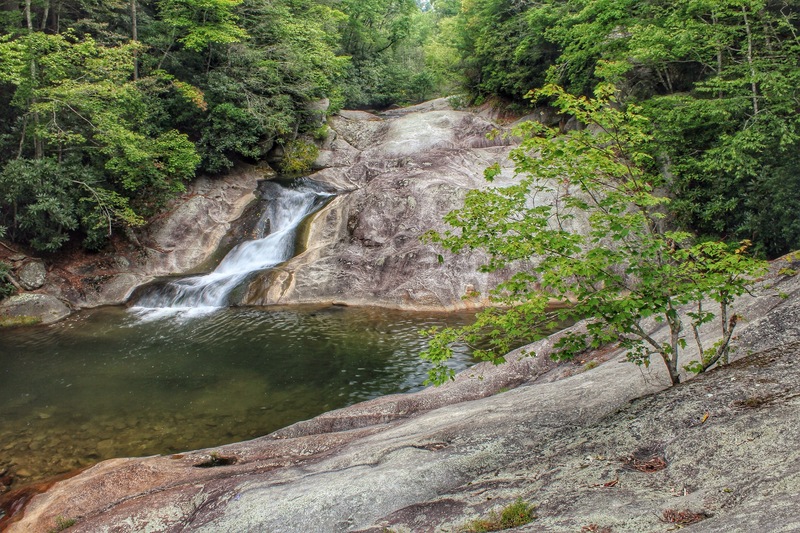 I did make the hike to Hunt Fish Falls on the Lost Cove Creek earlier this spring. That was a really nice place. 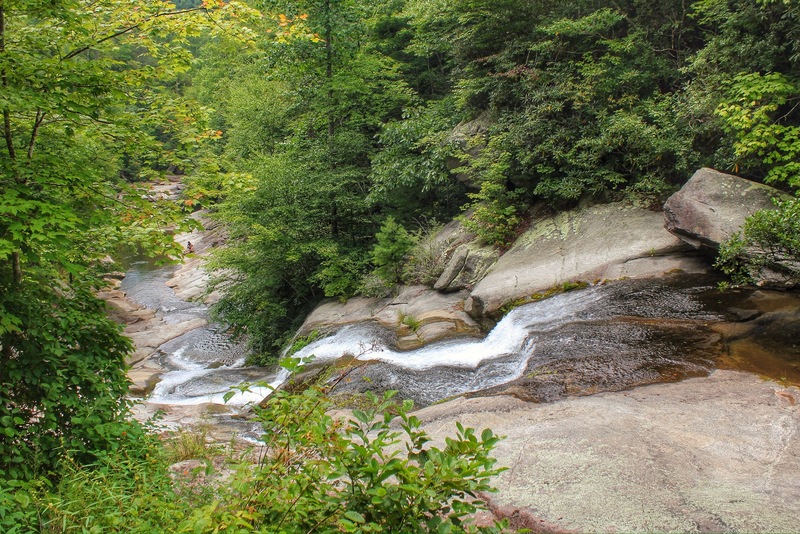 I didn’t really know it at the time, but I was very close to the confluence with Gragg Prong and should have kept going down the trail and made the turn upstream to see these falls. Well, I didn’t and now, in late summer, on my 3rd attempt, I finally made it back. 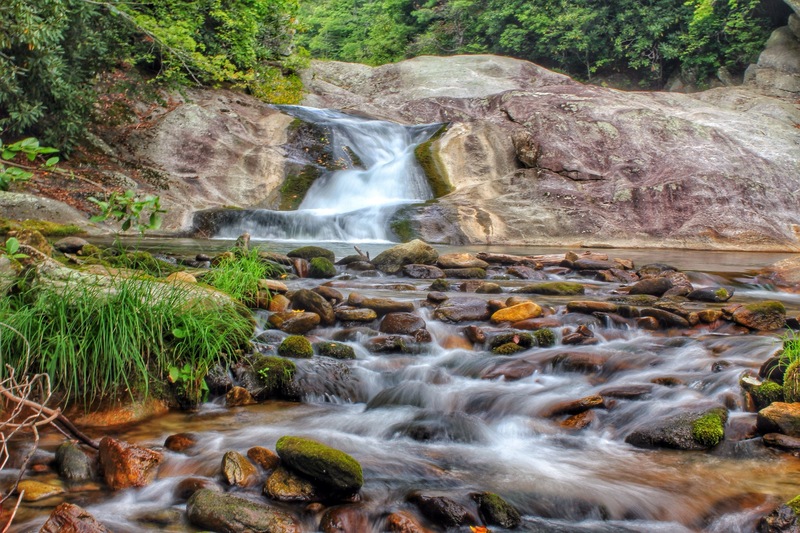 Gragg Prong is a tributary stream to Lost Cove Creek, then eventually the much bigger Wilson Creek. 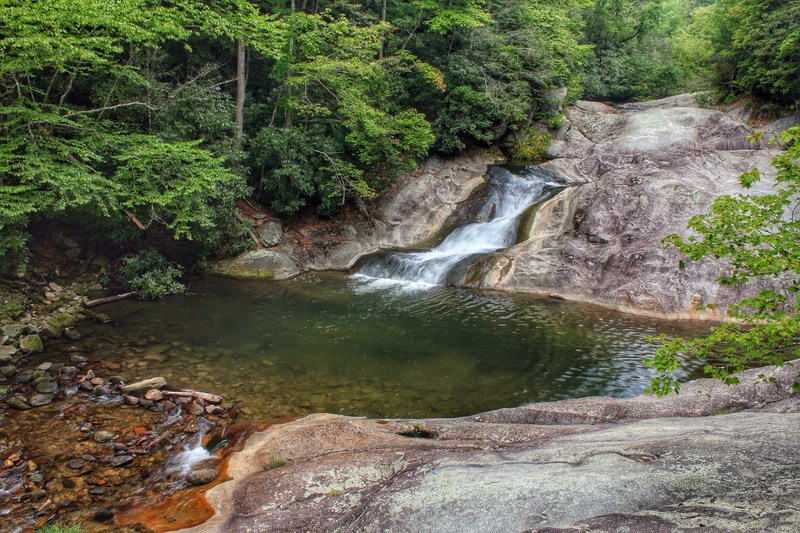 It is located in the upper northern section of the Wilson Creek Wilderness. 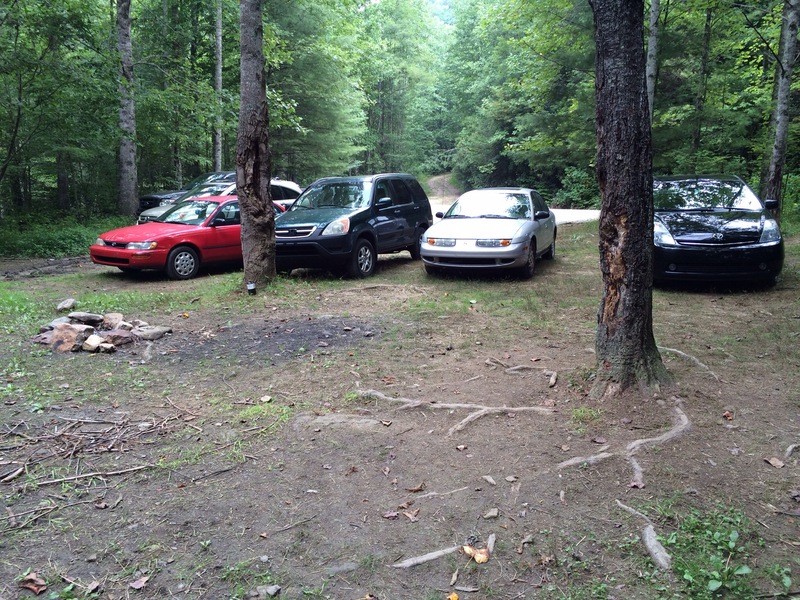 I learned of a different way to get to this spot that was more convenient and included less dirt road travel. This time it was right off the Blue Ridge Parkway, near the Grandmother Mountain overlook area, a few miles south of the Beacon Heights area. Roseboro Rd crosses the BRP near here. 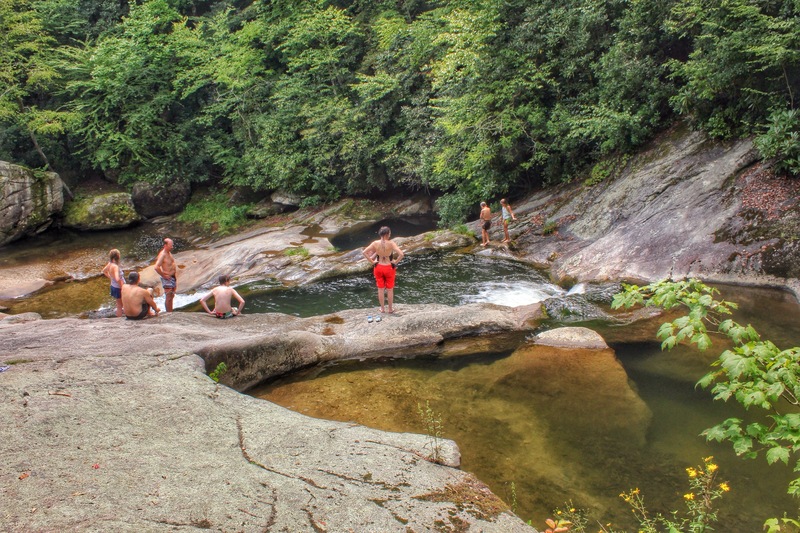 One direction takes you into the nice community of Linville, the other direction turns to dirt and leads to the waterfall and hiking paradise known as Wilson Creek. Heading south on the BRP, Wilson Creek is the left turn. Take this Roseboro Rd, about 5 miles down the mountain, dirt to paved, back to dirt until it crosses the Gragg Prong. Just beyond the bridge is a small parking area on the right. The hike starts here. 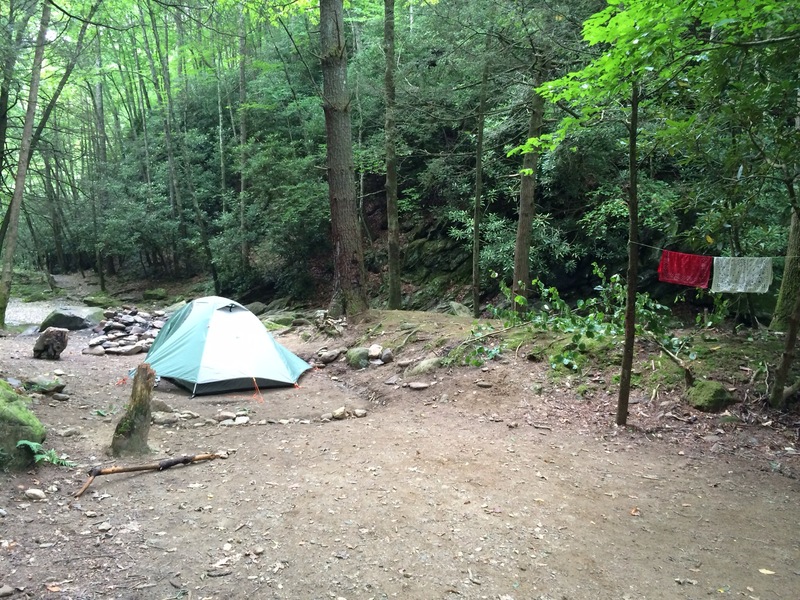 The trail first passes one of many campsites. Next is the Gragg Prong. It must be crossed for the first of four times. This is a pretty wide stream, flowing what seemed to be “normal” on this day. 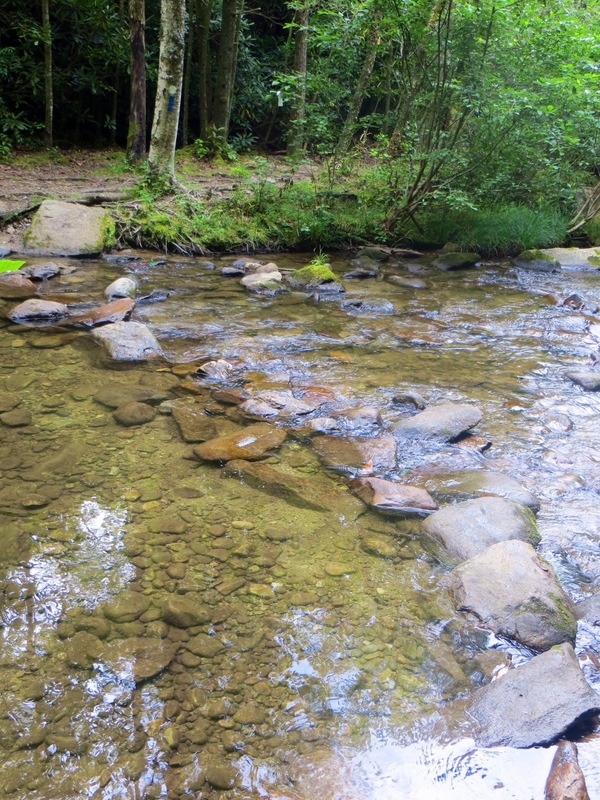 All 4 crossings can be safely “rock-hopped” in this normal flow, but any high water day might require wading. Just on the other side of the first crossing, is the first trail markings. 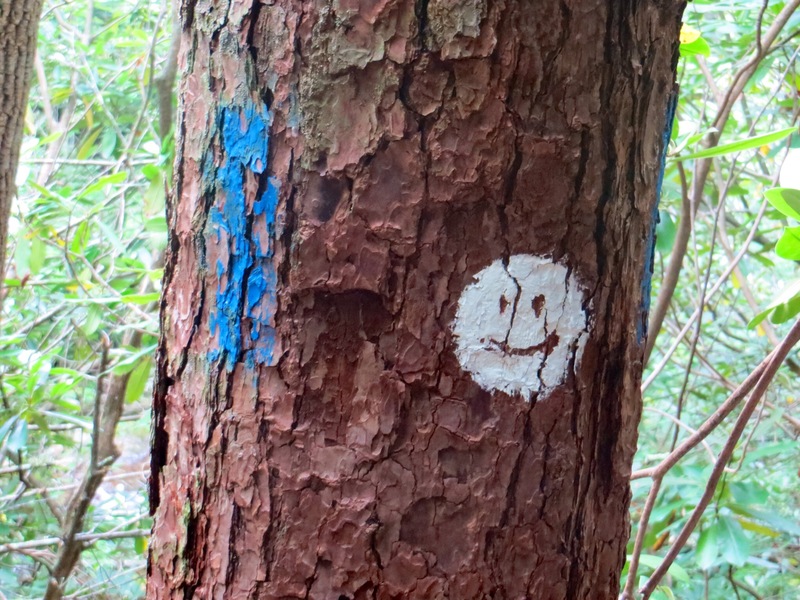 The tree is marked for 2 trails, the Lost Cove Trail in blue, and the Mountains To Sea Trail in white. 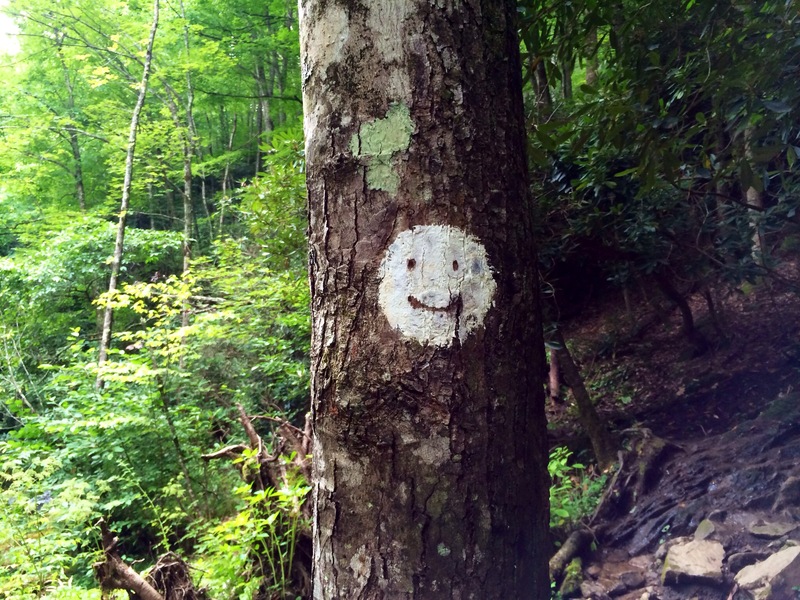 Someone has taken the time to decorate most of these white MST signs with smiley faces. The trail started out somewhat rough and eroded. Not to worry, it widens soon and is in better shape. 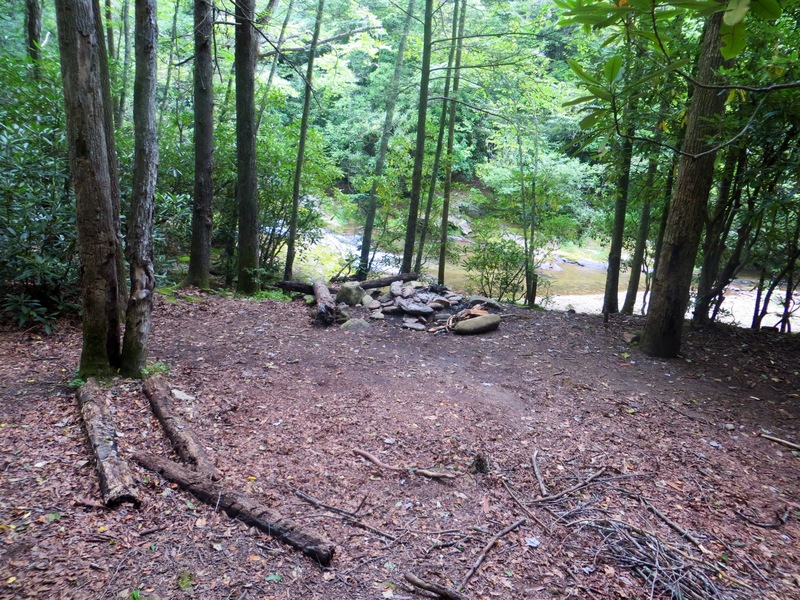 Soon after the trail passes another camp site, and creek crossing number 2 awaits. A hiking stick comes in handy on wide crossings like this. After the 2nd crossing, the stream begins to pick up its pace some. As the water got louder, the trail seemed to lead away from the stream. Luckily a side trail led back, only to find a gorgeous setting. 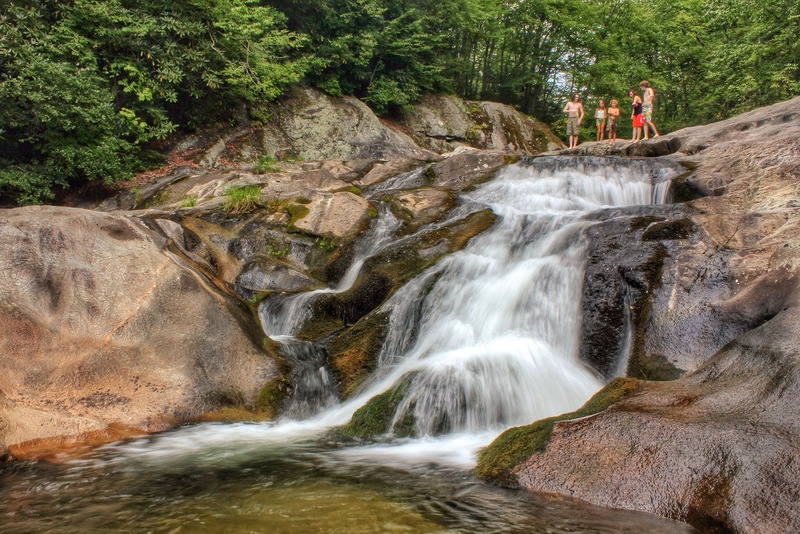 A small 15 foot cascading waterfall was there with lots of bedrock, rapids, potholes, and a killer swilling hole. 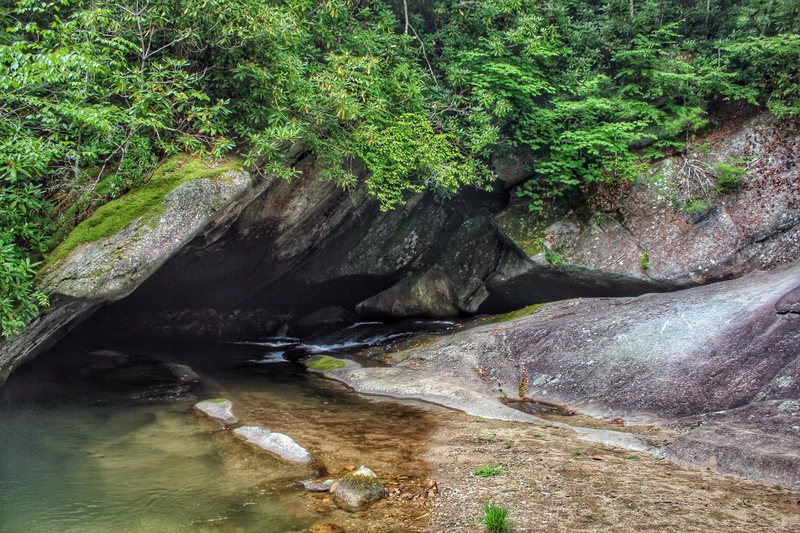 Near the bottom of the drop, the stream cuts into the mountain side forming a small cave, similar to what the North Fork French Broad River does at Cathedral Falls further south and west. I enjoyed this pristine setting for awhile, getting my feet wet, and just chilling out for awhile. 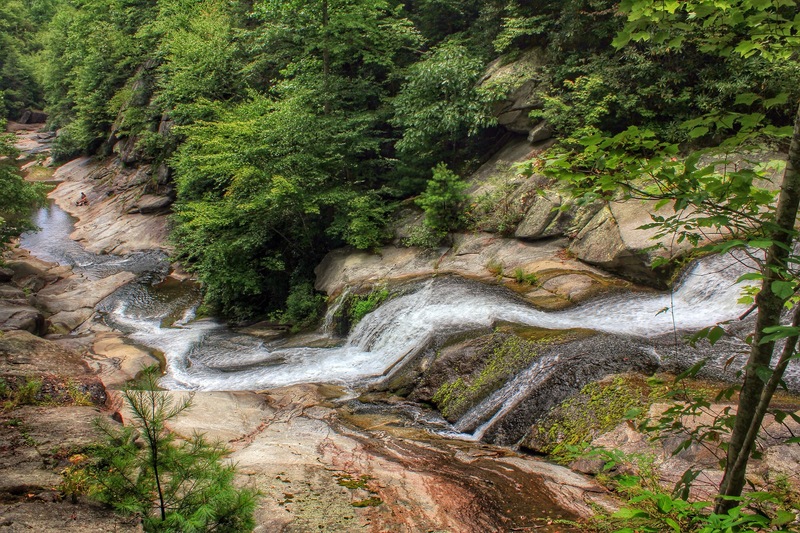 I first thought this to be the upper falls, one of the two waterfalls that I was here to see. It turned out to just be a bonus. 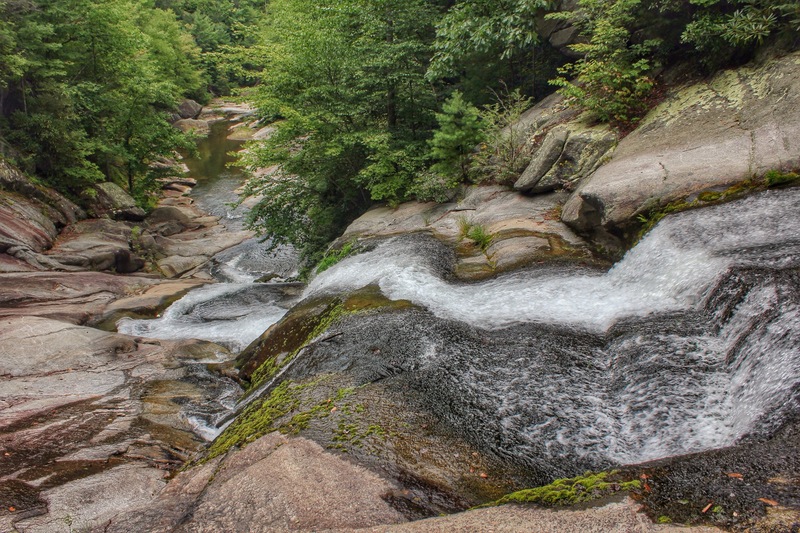 A little further downstream, the trail comes out at the top of Upper Falls. It was only 25 feet or so, but was very scenic with lots of character. 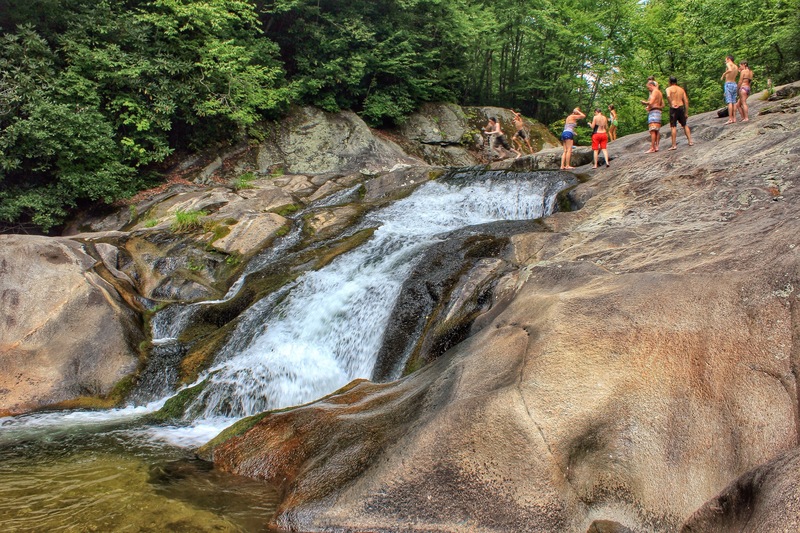 There was a 6 foot deep pothole/swimming hole at the top of this one that had a small crowd of people there jumping in and doing can openers. 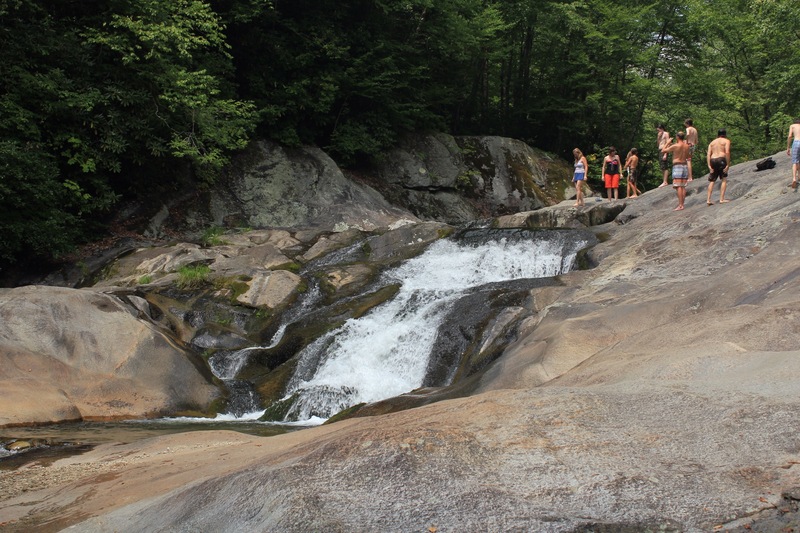 It was very cool, except just about everyone that jumped in almost slipped and fell while getting out. I could have spend half a day here at this spot, just like the first one. 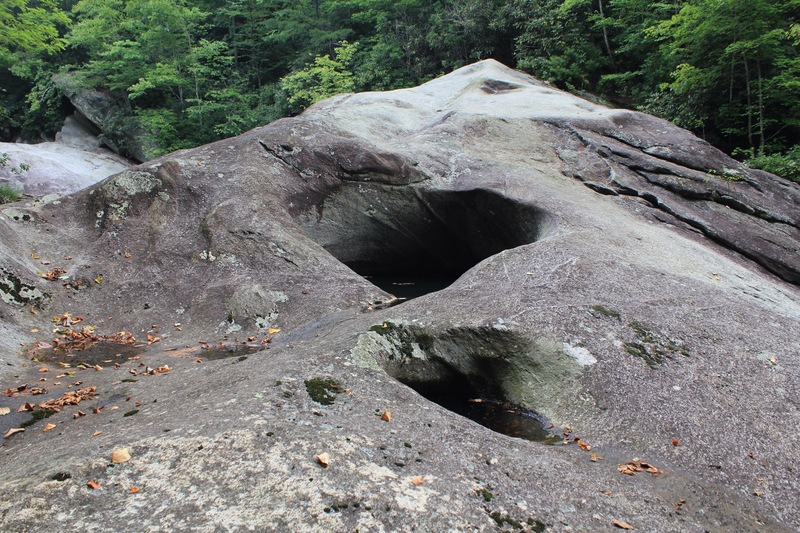 The bedrock here has been shaped and weathered over the years in a very unique way. 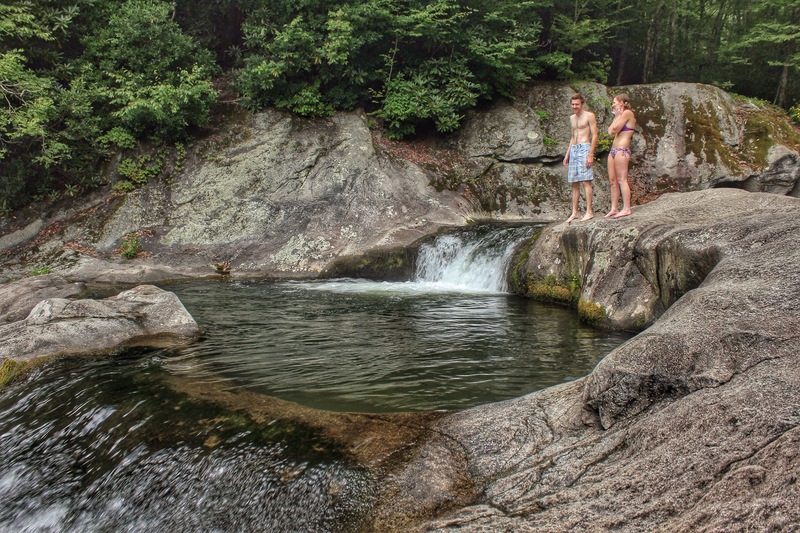 The jumping pool at the top was a really cool, rare waterfall feature as well. 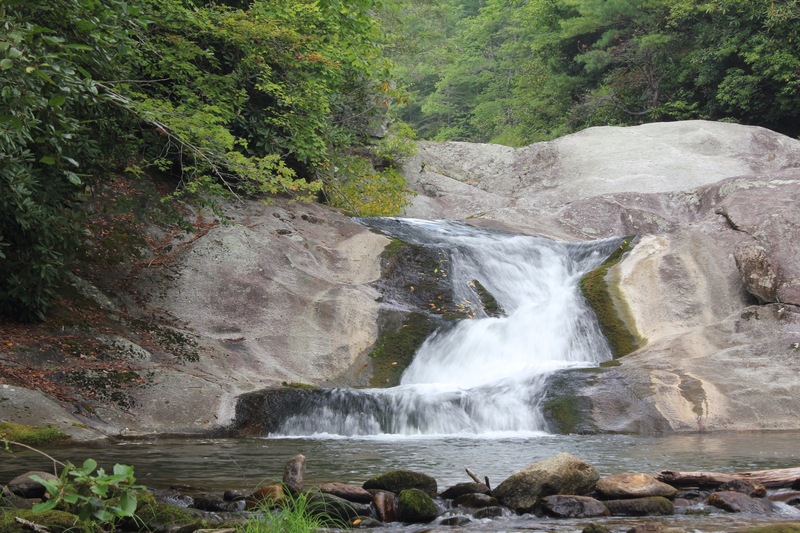 But, the 100 ft Lower Waterfall of Gragg Prong was still on the menu for today so off I went. It wasn’t but maybe another quarter mile, the the trail comes out near the top. 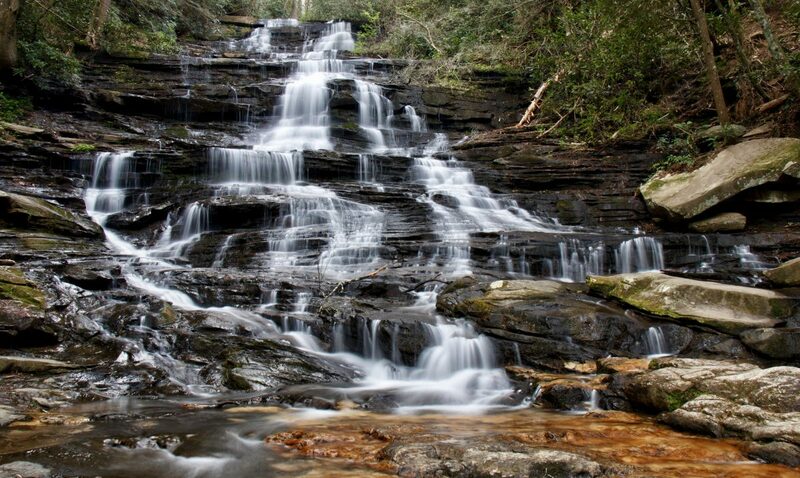 This was a very scenic cascade that makes somewhat of a right turn as it falls. I wandered about getting to the base, as I could see 2 people at the bottom fishing. The dry bedrock looked inviting, but very dangerous to try and go down this way. 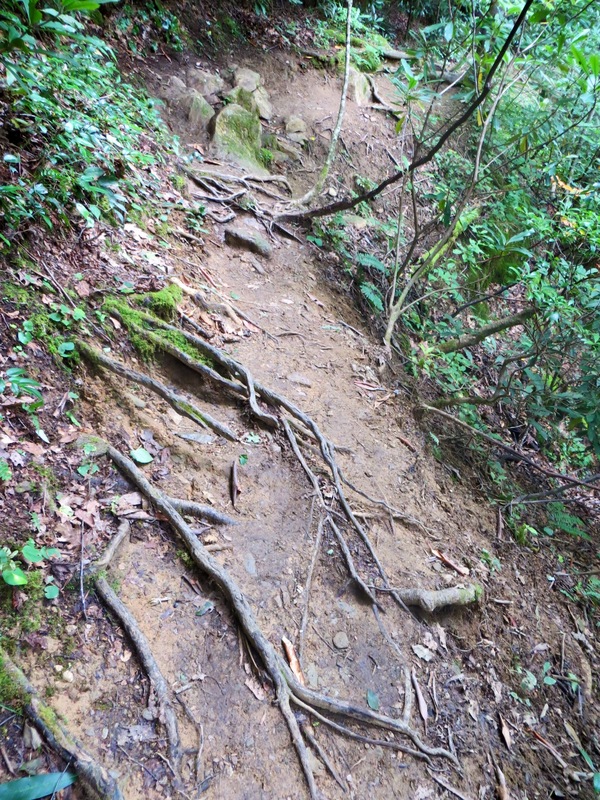 I imagine that I would have to go around and down the trail, then come back up. I decided against that today and just took photos from the top. 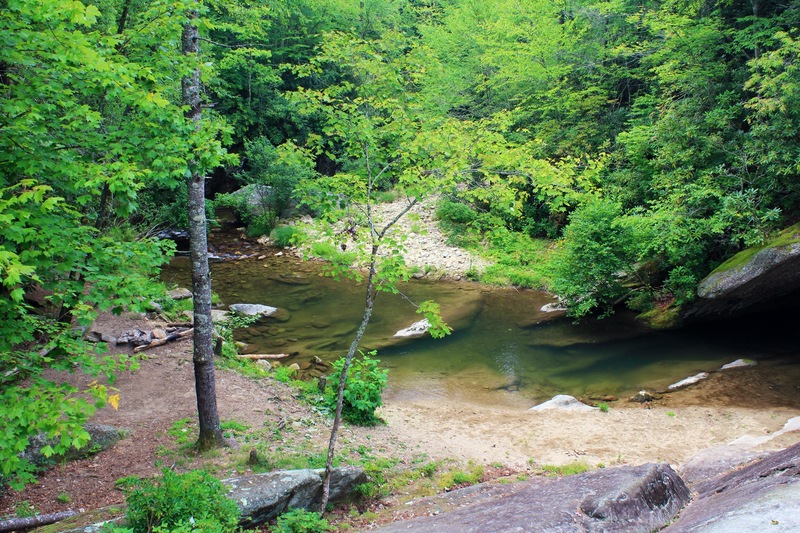 It was a great hike along a beautiful, large feeder stream to Wilson Creek. Do you think this would still be accessible in the winter? It’s definitely accessible in winter. I wouldn’t try it until this snow has melted. Thank you for this web entry. I and a couple of friends stumbled onto this area about 20 years ago for a weekend and I had been trying to find it ever since……we were in college and probably would not have remembered it at all except for the photograph proof that the weekend existed. I plan on heading back up there later this year when my camping buddy comes home from CA, he will be amazed that I finally found that same spot again, I will make sure we remember it this time. Thank God for the internet and mapquest or I would have never found it again!